The image histogram is often viewed as a thing of “extra information” and treated as a “good way to check for clipping”. While it’s true that the histogram provides a good check for highlight and shadow clipping, it also serves a greater purpose in post processing. Our mortal eyes are no match for the mighty histogram when it comes to tricky photos. Understanding the histogram and how your image editing software interacts with it can greatly improve your productivity and quality output. In a recent article, I went over “How to Read Image Histograms” while providing some visual examples in the realm of brightness and contrast — two very basic concepts when it comes to photography. Now, we explore how the histogram and image are affected by other basic post-processing adjustments. For the purpose of this article, we’ll be looking at the tools available in the “Basic” panel of Adobe Lightroom and Adobe Camera Raw (other packages should have similar tools available). 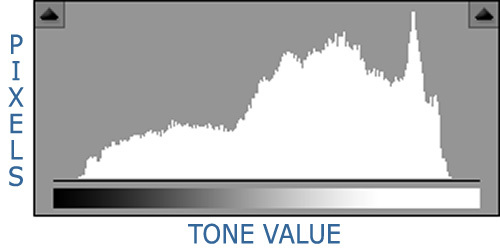 These tools have unique and specific effects on the image and the image histogram. With the basic tools presented here, you should be able to manipulate your image within 90% of its final stage — further adjustments will come from more advanced tools (which we’ll look at in the next article). In all of the examples below, I’ve added +50 to the base contrast setting so the effects of the adjustments can be visualized more clearly. This adjustment acts much in the same way camera exposure does, by basically shifting the entire histogram to the left or right. This has the effect of brightening or darkening your overall image. The shadows tend to be more anchored than the highlights, and you’ll notice some distortion of the histogram as you move the adjustment to either extreme. Notice that as you increase the exposure, the contrast tends to increase slightly due to the anchoring of the shadows. And as you lower the exposure, the contrast tends to decrease. This can be seen by the change in the width of the histogram. For “normal” exposures, you’ll just want to make sure the histogram is somewhere between the edges. If you’re going for a low-key or high-key image, you’ll want to push the exposure accordingly. If you have a well exposed capture, you shouldn’t need to adjust this setting very much. 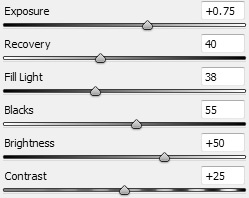 This adjustment is intended to recover highlights by pulling them back down a bit. Here, the shadows are completely anchored and the increased recovery lowers the tone value of the highlights and upper midtones. In this example series, I’ve started with an intentionally overexposed image to show the effect. In practice, I rarely need to adjust above a value of 25 or 50. Go much further than that, and you end up pulling your highlights into a gray area, making the image look flat due to lower contrast. This adjustment is the exact opposite of the recovery tool. Here, we pin down the highlights and increase the tonal value of the blacks and lower midtones. In this example series, I’ve started with an intentionally underexposed image to show the effect. In practice, I rarely need to adjust above 25 or 50. 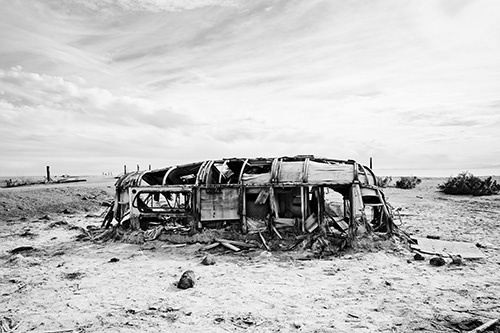 Go much further than that, and you start pushing your blacks into a gray area and losing contrast and tonal depth. This adjustment is sort of an anti-fill light… it brings your shadows down further into the dark region while having less effect on the highlights. This is good to use when you have less than perfect blacks and you need to tug that histogram just a little to the left. In this example series, I’ve started with an image of slightly higher brightness to better show the effects of this adjustment. We went over the brightness adjustment in the last article, but I’ll add a few notes here. You’ll notice that it acts very much like the exposure adjustment, pushing the image brighter or darker (and moving the histogram to the right or left). But it does this in a slightly different manner. 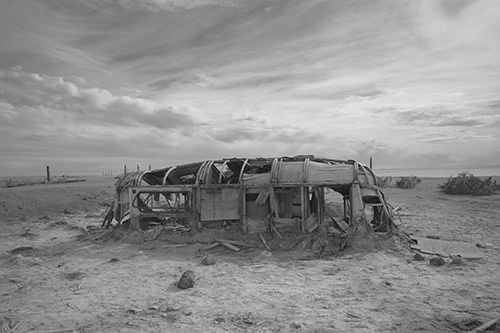 The exposure control is more directed toward the extremes of the histogram, while the brightness control is more directed toward the center of the histogram (midtones). It still moves your highlights and shadows, but it moves more of your midtones than exposure does. In this example series, I’ve started with the default image of +50 on the contrast and no further adjustments. We also went over contrast in the previous article, noting that the wider histogram equates to more contrast. This is a handy adjustment tool to use when your histogram doesn’t quite reach the edges at the blacks and whites, or if your image looks flat due to a heavy midtone concentration. And again, you can see that the brightness and contrast adjustments are tied together and not completely independent. Understanding your histogram allows you to process the photo on a technical front rather than on pure aesthetics. Understanding how these basic adjustments affect the image and the histogram will allow you to manipulate it with more confidence. But don’t get too caught up in watching your histogram — in the end, the only thing that matters is a photo that appeals to your eyes. This entry was posted in Features, Photoshop Tips and tagged acr, adobe, adobe camera raw, histogram, lightroom, photo editing, photography, photoshop, post-processing on January 19, 2010 by Brian Auer. A lot of interesting stuff happening this week in the world of photography. Check out the results from the portrait contest over at DIYPhotography! Udi had a lot of great entries, and I had the honor of being one of the two judges for the contest. Did you ever see that photo of Palin in a Bikini that swept across the Internet not too long ago? Well, Jim found the creator of the photo and here’s a transcript of his interview with her. Here’s an interesting piece of software to try out, and a competition that goes with it! Looking to fill up your feed reader? Check out this huge list of podcasts, vidcasts, and photography blogs. 10 tips for photographing kids, and lots of great examples to go with them. This is insane — an animated series of photos showing the Nikon D3 mirror flipping up and the shutter releasing. A few real-world photography lessons, in the form of a comic strip. A dissection of the histogram and how it can be used to evaluate your photos. Tips for shooting in low light including lens choice, ISO, shutter speed, and flash equiment. This entry was posted in Roundup and tagged children, contest, histogram, light, links, News, nikon d3, photography, portrait, resource, Roundup, sarah palin on September 14, 2008 by Brian Auer. Before we get to the links, I just want to mention quickly that we had our photowalk in La Jolla today. The turnout was awesome! I lost count, but I think probably 15 to 20 people showed up from across Southern California and one from North Idaho. Just about everybody in the shot below was part of our group, plus we had a few others that weren’t in the frame. We had a great time, and I’ll try to post a recap on Monday the 18th — that way people have a chance to get through processing some photos and put them up on Flickr and whatnot. Results from a photo editing project similar to the one we ran on Epic Edits. 17 people give their very artistic interpretation of one image. It’s pretty amazing what a difference a new sky can make in your photos! Good solid street photography tips that talk about candids, fair game, knowing your equipment, expecting the unexpected, and the general nature of street photography. Antoine gives us 9 great tips for improving our pet photos. 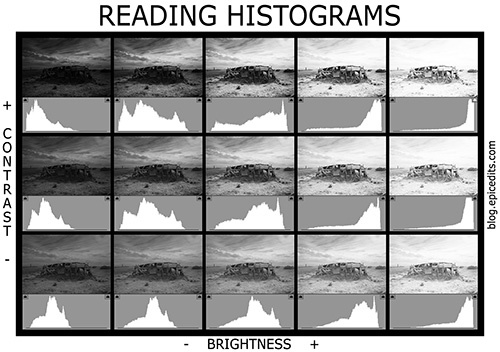 A guide to reading a histogram and using that knowledge to take better photos. 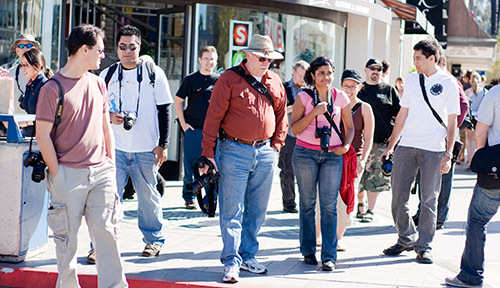 Going on your first photowalk? Don’t forget to take these things with you! A great big giant list of Photoshop resources including filters, brushes, actions, plugins, tutorials, magazines, associations, and other resources. This entry was posted in Roundup and tagged art, art and photography, digital photography, foto, histogram, links, pet photography, photo, photography, photos, photoshop, photowalk, photowalking, project, resource, Roundup, sky, street, street photography on February 10, 2008 by Brian Auer.